iBall adds yet another exciting range of Portable Bluetooth Speakers with “iBall Karaoke Barrel and Musi Barrel BT31”. 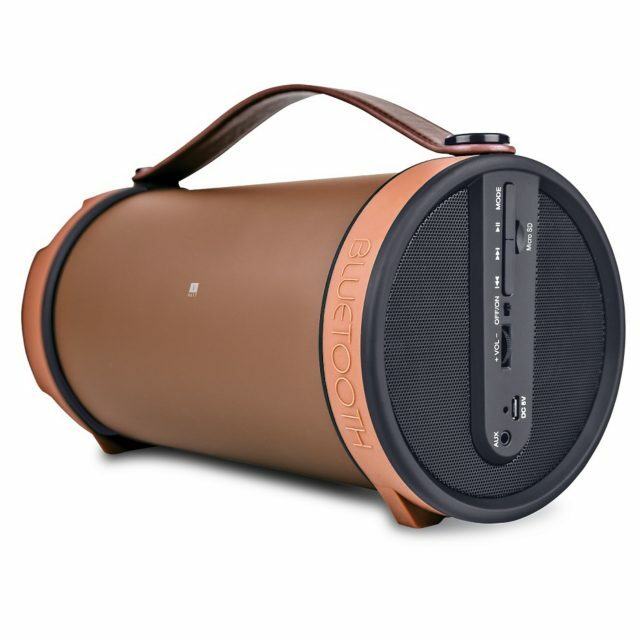 Like the nickname suggests, thanks to its uniquely designed barrel shape, the speaker drives audio in multiple directions, which helps create a more immersive soundscape – Nothing but Crisp, POWERFUL sound around you.Designed specifically for portability and on-the-go use, both speakers have an easy to carry strap handle accentuated by its lightweight design which make them incredibly compact and perfect for travel. Various controls have also been integrated on the speakers itself to allow seamless manual control.Equipped with a powerful 4″ Woofer and 2″ Satellite Drivers that offers high-sensitivity and dynamic range, the iBall Musi Barrel BT31 ensures every detail of your vocal performance will come through loud and clear in both soft ballads and rock numbers.Giving you a rich and crystal clear audio output, the iBall Musi Barrel BT31 Bluetooth Speakers have soothing and strong sound 11W RMS total output speaker drivers to give you a distortion-free sound. Furthermore, the built-in rechargeable battery allows the speakers to give you a playtime of up to 4 hours.Enabling you to play music from any Bluetooth enabled device, the iBall Musi Barrel BT31 Speakers host extensive connectivity options to give you full-fledged entertainment. You can enjoy your favorite tunes using the 3.5 mm Aux cable or plug Micro SD Card directly into the speakers bringing uninterrupted entertainment. Likewise, you also have FM Radio playback in the speakers ensuring an undivided user experience.Equipped with a powerful 6″ Driver that offers high-sensitivity and dynamic range, the iBall Karaoke Barrel ensures every detail of your vocal performance will come through loud and clear in both soft ballads and rock numbers. What’s more? You also get a Mic free with the iBall Karaoke Barrel, which supports 2 wired Mic simultaneously giving you the freedom to team up with your best friend and sing the song you have been humming all week long. The speaker also boasts a LED Display to highlight the details and working status.Giving you a rich and crystal clear audio output, the iBall Karaoke Barrel Bluetooth Speaker have a strong and powerful bass with 15W RMS total output speaker drivers to give you a loud and distortion-free sound. Furthermore, the built-in rechargeable battery allows the speakers to give you a playtime of up to 5 hours.The iBall Karaoke Barrel Bluetooth Speakers enables you to play music from any Bluetooth enabled devices. Host extensive connectivity options to give you full-fledged entertainment. You can groove to favorite tunes with several extensive connectivity options such as the 3.5 mm Aux cable, USB Pen Drive or SD Card directly into the speakers bringing uninterrupted entertainment. Likewise, you also have FM Radio playback in the speakers ensuring an undivided user experience.